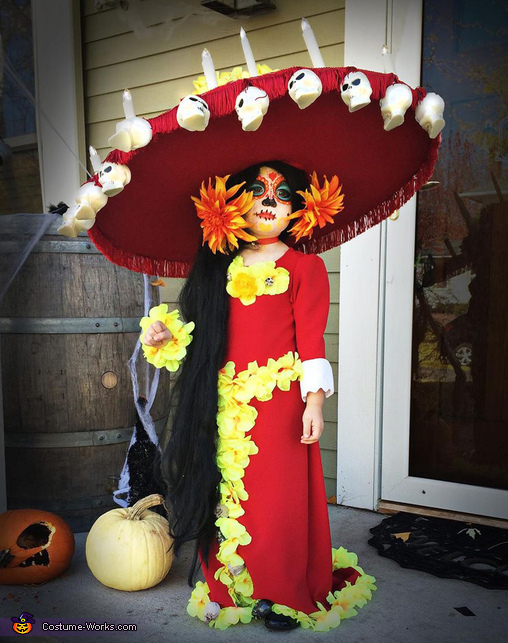 My 4-year-old daughter is wearing the La Muerte costume from Book of Life. We are big fans of the film, and have always had an interest in Dia de los Muertos since her father and I married in Mexico. La Muerte is her favorite character, so it made perfect sense for Halloween. The costume is all DIY. It is topped off with a fabulous 32" hat made of layers of foam core, red fabric, skull lights and candles that both light up (via battery), marigold flowers, and fringe. My daughter patiently sat for 45 minutes while I painted her sugar-skull face, and donned a black full-body-length wig and giant flowers in her hair. Her dress was sewn from scratch (thanks grandma) and I sewed on rows of fake flowers on her bodice, and down the front, and around the hem of the gown. Little skulls were attached throughout the flowers on her dress and hat and jewelery, which we also made. She made a stunning vision, this tiny thing that seemed to float, a vision of red and candles and flowers and life. And that hat. So big it was almost as wide as she is tall.